Pastor David K. Brawley is a homegrown blessing. The New York native recognized his call to the church at the tender age of 14 and has been moving for God and his community since. In addition to founding faith-based organizations for young men, Pastor Brawley promotes social justice through his community as the co-chair of the Metro Industrial Areas Foundation’s East Brooklyn Congregations helping form the “Don’t Stand Idly By” gun campaign, put in motion affordable housing, public safety, education reform and more. Pastor Brawley believes creating environments of nurture, investing in institutions and creating a community feel are just a few ways can churches can help in shaping our future leaders and aid community change. His bold and selfless efforts make you wonder… how can we apply this method to our own churches? To learn more about St. Paul Community Baptist Church visit spcbc.com. 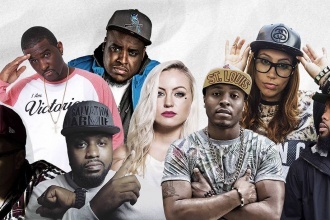 Christian hip-hop’s finest gather to recognize God’s talented children at the 7th Annual Kingdom Choice Awards.